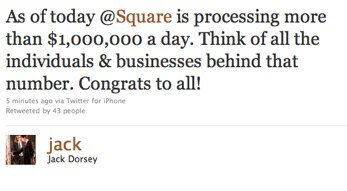 Mobile payments startup Square has reached a new milestone this week—the company is now processing $1 million in payments per day, co-founder Jack Dorsey just Tweeted. Square was processing a few million in mobile transactions per week as of last fall, so the startup has seen a steady increase in transactions over the past four months. The startup just raised $27.5 million in new funding, and is gaining a lot of a lot of buzz, most recently debuting a fairly large billboard in Times Square. And last week, Square announced that it is dropping the $0.15 per transaction charge for businesses using the mobile payments service. COO Keith Rabois told us in January that the startup is expected to process $40 million in transactions in Q1 of 2011 and is currently signing up 100,000 merchants per month. That’s compared to 30,000 monthly signups last Fall. Square has no doubt created a foothold amongst small businesses, as the service is free to implement and now has cut out the transaction charge completely (a move that competitors VeriFone and Intuit have yet to make). But it should also be interesting to see if Square will announce large-scale implementations with retailers in 2011. This will no doubt help scale the company’s reach even further. Fun fact—Square’s technology was also showcased by Apple at today’s iPad 2 event.